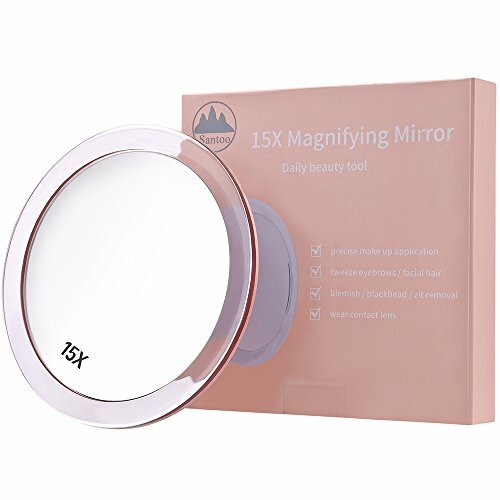 ● Strong 15X Magnifying Mirror - The strong 15X magnification helps you to see the details on your face clearly and put your makeup on easily. Perfect for those with vision difficulties too. It is great for precise makeup or tweezing etc. ● Three Suction Cups for Easy Mounting - This mountable mirror has 3 suction cups so it is easy to mount and stays steadily where you mount it. ● Eligible Viewing Area - The viewable area of mirror is 4.8 inches which is fixed on the 6 inches circular acrylic frame that is large enough to show what you need to see on your face. ● High Quality Clear Acrylic Frame - Professional makeup mirror design with sleek acrylic frame. ● Portable Travel Mirror - Mirror easily comes off and can be remounted repeatedly and easily. The size is not so big that is great for traveling without taking up too much space. ● Handheld Makeup Mirror - This mirror can also be unmounted and just use hand held. ● Rose Gold Color on the Back - This color makes the mirror looks cool and unique. 1. Mirror viewable area is just 4.8 inches. 2. Start up looking into the mirror closely at about 2 inches away from your face and then move slowly until you've got a best focus to ensure have a great clarity on the 15x magnification mirror. If you have any questions about this product by Santoo, contact us by completing and submitting the form below. If you are looking for a specif part number, please include it with your message.